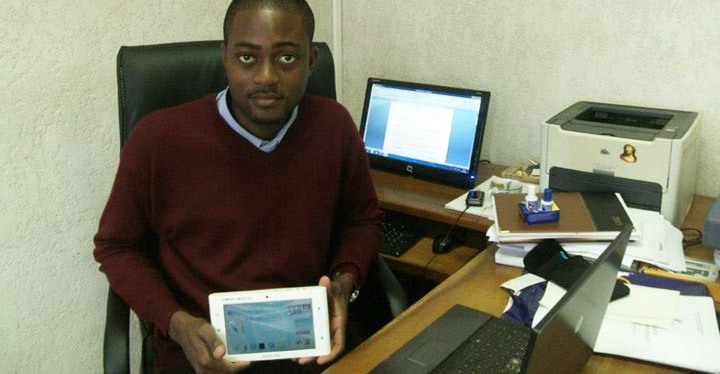 Arthur Zang, a 26-year-old Cameroonian, is the inventor of the Cardiopad, the first fully touchscreen medical tablet made in Cameroon and in Africa that could save millions of lives around the continent and beyond. The Cardiopad is especially crucial in countries like his own, which only has 30 heart surgeons for a population of around 20 million, based in the two largest cities, Douala or Yaoundé, Cameroon’s economic and political capitals. Often, people experiencing heart conditions in remote rural areas are forced to endure an expensive, physically straining and time consuming trip, in order to reach a specialist doctor, which can exacerbate the patient’s health problems. As well as the trouble of distance, appointments have to be made months in advance, which can be fatal for some patients. The Cardiopad tablet can perform heart consultations, such as the electrocardiographic (ECG) examinations of patients, in order to acquire cardiac signals from the patient, which it subsequently filters and processes, displaying a report of the results. It then transmits the results via the GSM network to various cardiologists throughout the country, who can place a diagnosis, provide professional advice on any needed prescriptions or procedures, thus saving the patient’s time and resources. The tablet comes with electrodes, which, just like in the case of a classical electrocardiograph, are placed on the patient and connected to a module that, in turn, connects to the tablet. Apart from conducting the ECG examinations, the Cardiopad can also be used as a electrocardioscope to monitor a critical patient. It also an integrated digital cardiology encyclopedia, the Cardiopedia, containing 0ver 5,000 words that can be used by the cardiologist in conducting his diagnosis. The Cardiopad is usually used by nurses in district hospitals, which do not have specialists in cardiology. In order to address the challenge of electrical supply in Cameroon, Zang made sure that the Cardiopad has a seven-hour autonomous battery and that the ECG examination can be performed in just five minutes. The Cardiopad also helps hospitals considerably reduce the costs of medical examination, as its price is around 1,500 euros, while the current price for an electrocardiograph is 3,800 euros. Zang first became interested in medical technology in 2009, when he was in his fourth year at the Polytechnic National High-School of Yaounde, conducting an internship at a hospital, when he discovered the lack of cardiologists in his country. He became determined to work on a solution to improve the life of patients living in rural areas and help cardiologists monitor their patients remotely. The Internet and the tablet proved to be his most useful partners in developing his idea. Zang took a free long-distance learning program offered by the Indian government, which allowed him to delve into the world of electronics and revealed different ways the use of the table to perform heart examinations. In 2010, the first version of the Cardiopad was ready. Zang tested the efficiency of his device, by carrying out scientific tests validated by the Cameroonian scientific community. According to the young Cameroonian, the reliability of the tablet’s results is 97.5 percent. The young Cameroonian faced some obstacles in gathering funds for his invention, as he was repeatedly rejected by banks. Through his persistence and determination, Zang nevertheless managed to receive $30,000 from the Cameroonian government to create his own business, Himore Medical, which develops and produces the Cardiopad and focuses on distributing them on a national and continental scale. The company also creates other medical-embedded systems, such as autonomous electronic and computer systems needed in the healthcare industry, focused particularly on the most pressing health issues in Africa, such as malaria. Himore Medical also ensures technical support services to Cardiopad users. For his great invention, the young Cameroonian inventor was recognized as one of TIME’s 2013 30 under 30 people Who are Changing the World,’ and one of 2013 Forbes Magazine’s ‚30 under 30’ list. He also received the 2013 African Mobile Award. Zang is also determined to encourage the next generation of Cameroonians to study science and technology and hopes to represent an example for them, as he believes that the only way to ensure sustainable development for Africa is to encourage research and innovation.